Tokyo, December 16, 2016 - NEC Corporation (NEC; TSE: 6701) today announced the development of a "remote gaze detection technology" that enables real-time detection of the direction an individual is looking, even when using existing cameras from remote locations. Conventional technologies estimate an individual's line-of-sight using specialized devices equipped with infrared lights and advanced cameras that detect light as it is reflected from an individual's eye. This new technology, developed as part of NEC's cutting-edge portfolio of artificial intelligence (AI) technologies, NEC the WISE (*1), uses face feature point detection technology, the core of NEC's world leading face recognition technology (*2), to accurately identify characteristics in and around the eye, such as the pupil and the corners of the eye, from images taken with common cameras, including web, surveillance, tablet and smartphone cameras, without the need for specialized equipment. These images and technology enable highly accurate detection of an individual's line-of-sight, with a measurement error of less than 5 degrees from the left, right, top and bottom. 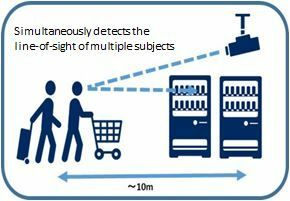 Moreover, this remote gaze detection technology's advanced response to low resolution images and changes in brightness enable it to detect an individual's line-of-sight, even when they are separated from the camera by 10 meters, making it well suited for automatically detecting products that draw the attention of shoppers at retail stores. Furthermore, the high speed computations of its "feature value extraction technology" enable it to simultaneously detect the line-of-sight of multiple individuals, without compromising the accuracy of its results. As a result, even when multiple persons appear in a camera, it is possible to simultaneously detect the line-of-sight of each individual. 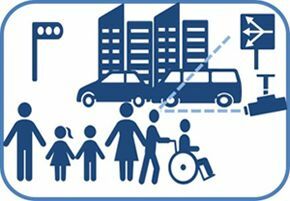 "Based on this technology, NEC can evaluate the line-of-sight of pedestrians and help to optimize the placement of important announcements on public streets," said Akio Yamada, general manager, Data Science Research Laboratories, NEC Corporation. "Moreover, the technology can contribute to the safety and security of our communities by helping to monitor the behavior of suspicious individuals. This is in addition its business potential, where the technology can help retailers learn more about which products are attracting the most attention from visiting customers."